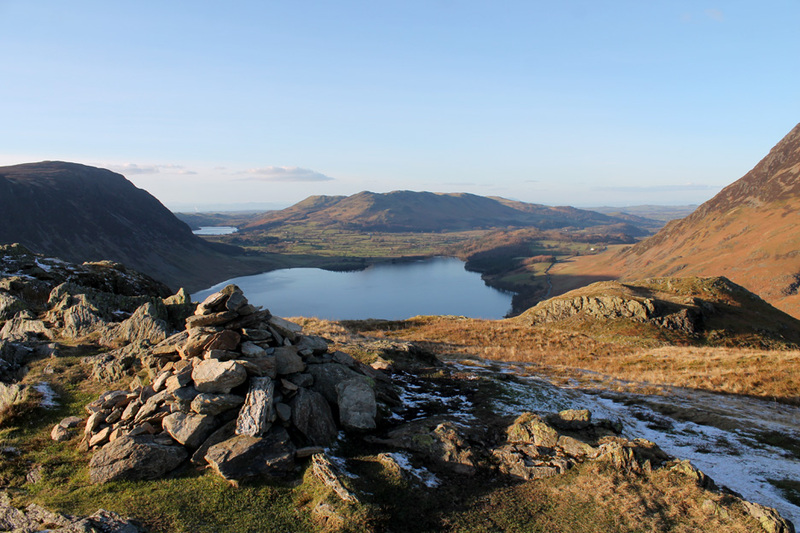 " Rannerdale Knotts from the Middle "
Date & start time: Monday 15 th February 2016, 2.35 pm start. 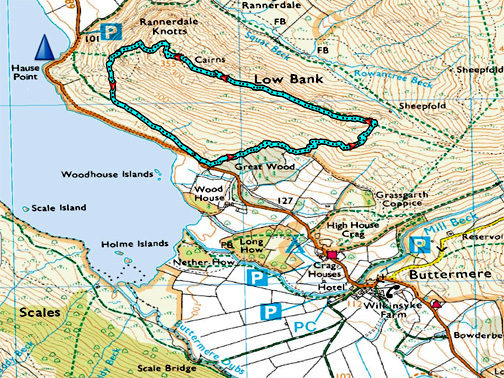 Places visited : Great Wood, Low Bank, Rannerdale Knotts and back. Walk details : 2.2 mls, 950 feet of ascent, 1 hour 55 mins. Weather : Lovely afternoon sunshine, cool enough for a hat and light gloves. 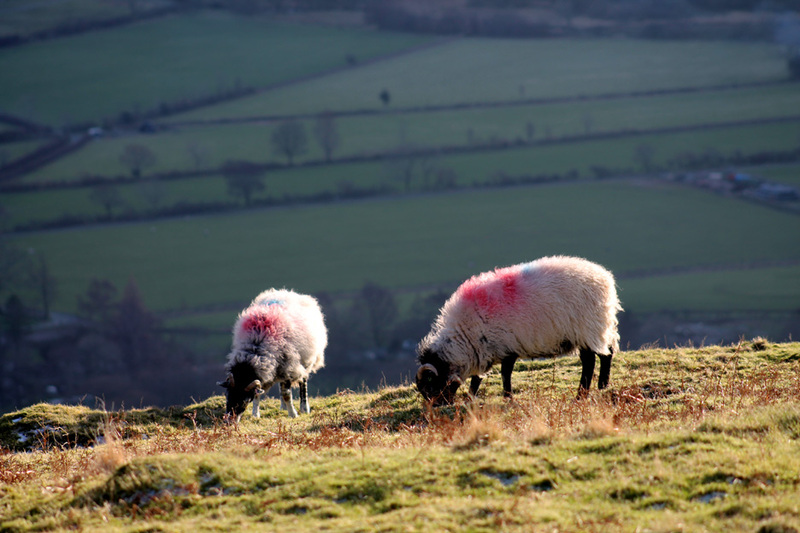 so we chose a local fell but walked it from a slightly different angle. 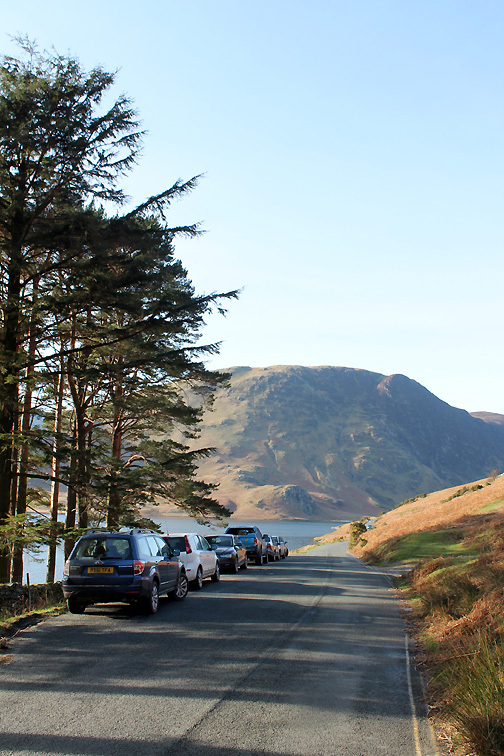 It is the local half term this week and car parks are full but we only saw a few people on the whole of the Rannerdale walk. A different start point . 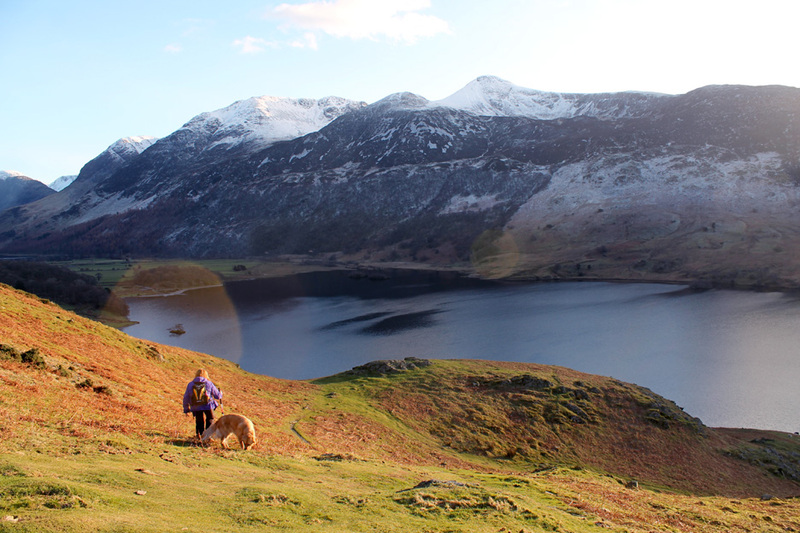 . . at the head of Crummock. Parking alongside the rather weather beaten pines. Keeping off the road on the small diversionary route over the knoll. It's all of 50 yards and gets you back down to the road anyway . . .
but hey . 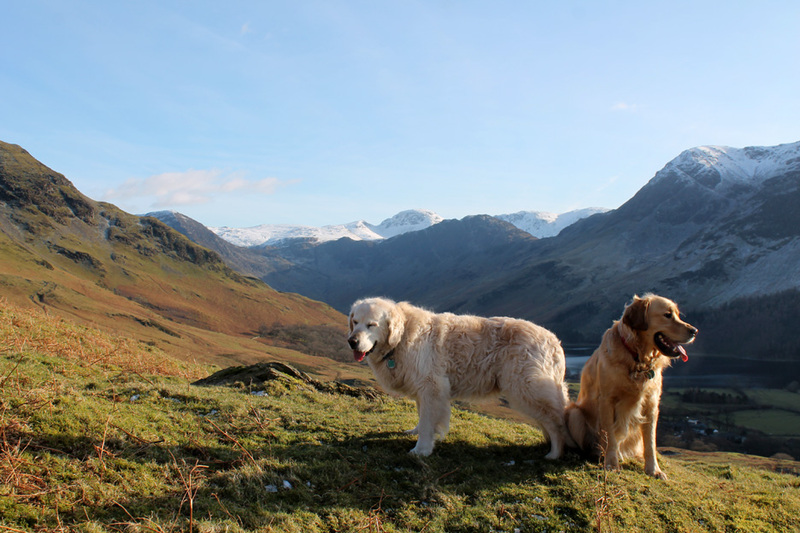 . . the views are nice and there's no fighting the cars on the blind bend. which run along the southern side of Floutern Pass. Today we're aiming for the summit up there . 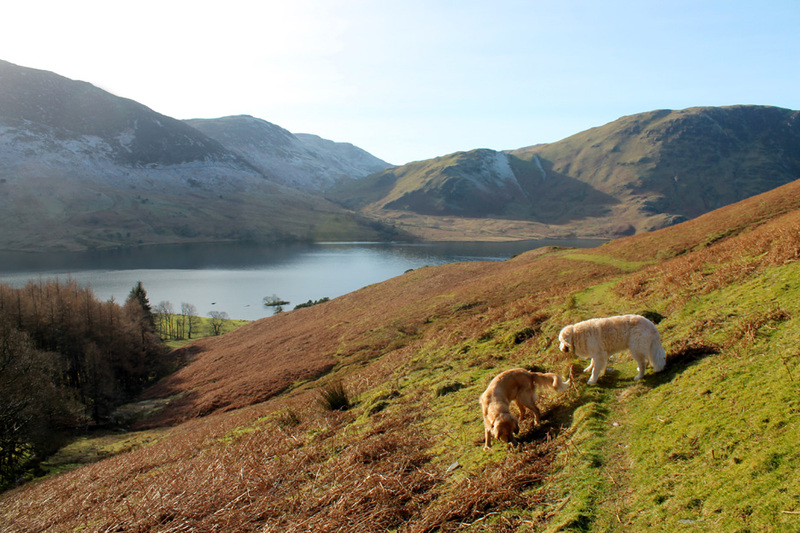 . . Rannerdale Knotts. Great Wood in wintery mantle. This is a less used path and you have to duck below the odd branches of trees growing on this side of the wall. 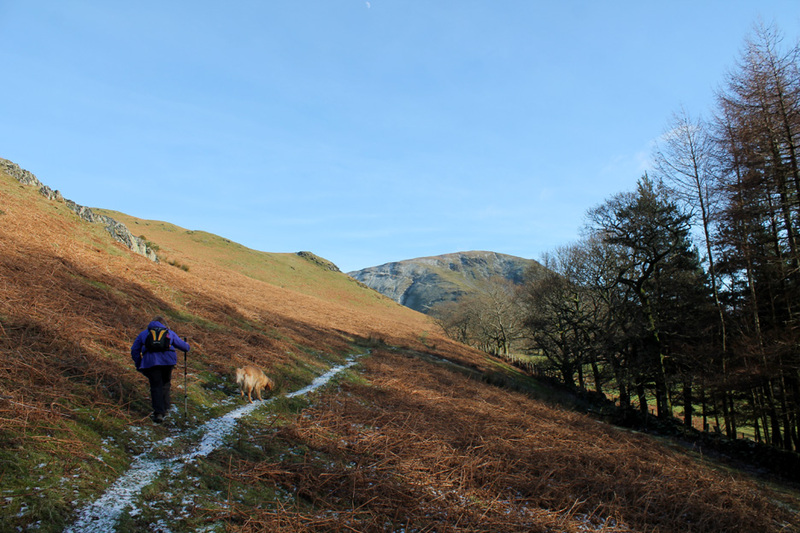 Escape to more open ground is as easy as climbing further up the slope. We join the good path that runs along behind the woods. 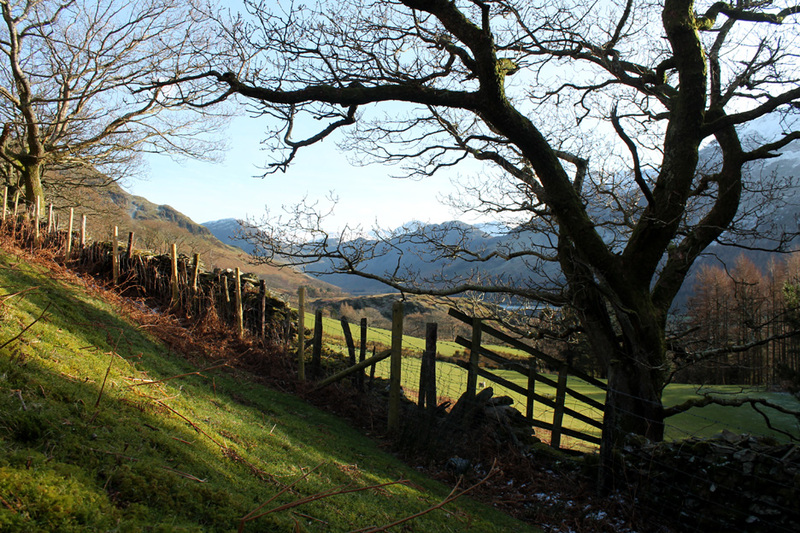 This old path connects Rannerdale Farm with the Newlands Pass, without the need to negotiate Buttermere Village. 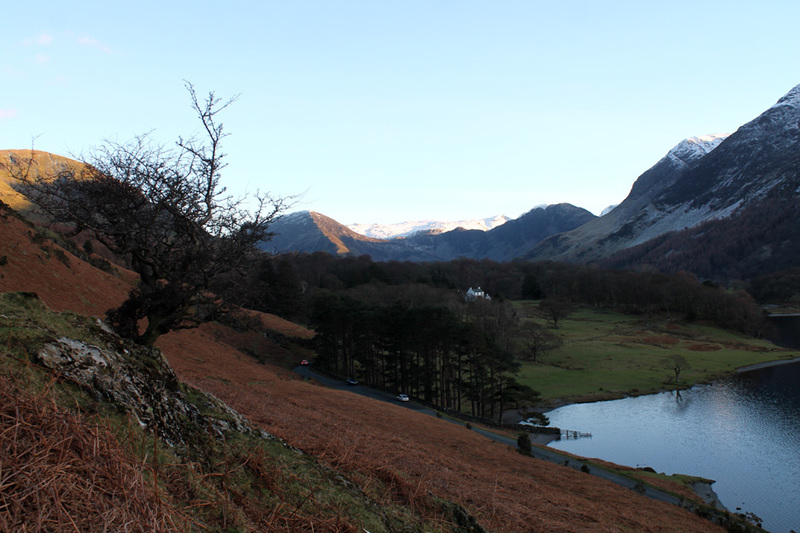 Through the trees we enjoys a sunny view up to the head of Buttermere. 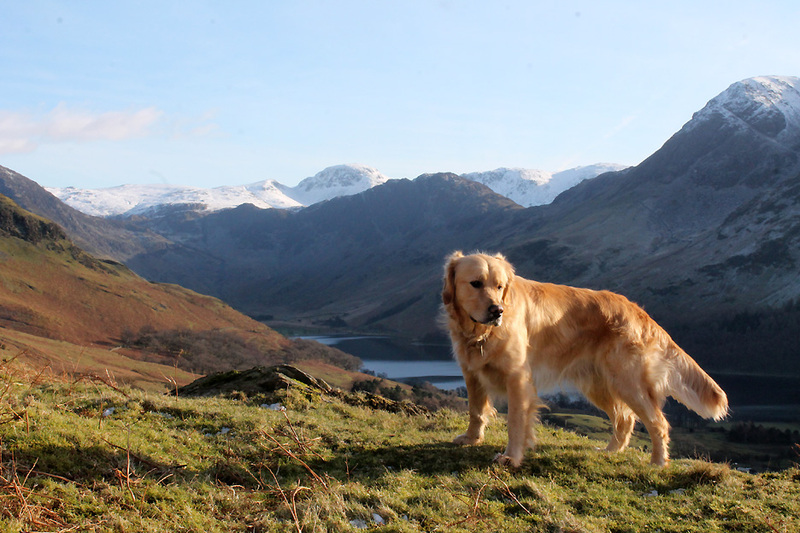 Snow on the high fells . 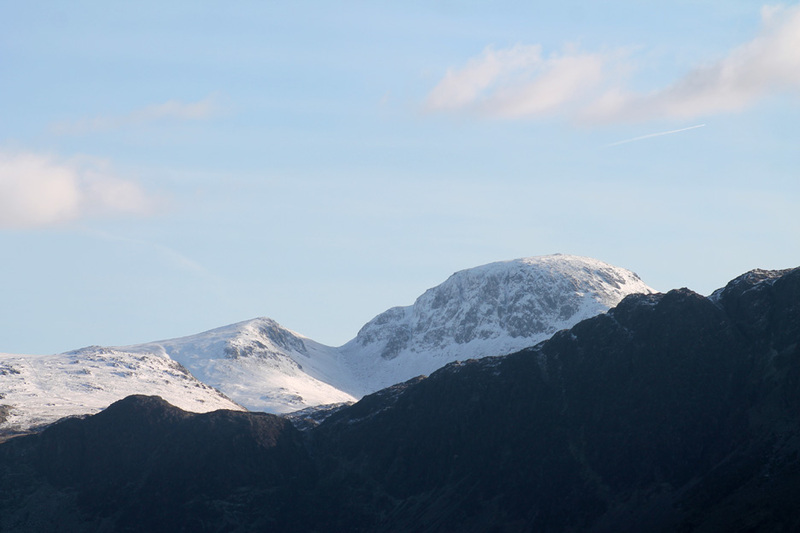 . . in fact last night's valley rain has added slightly to the snow cover on the tops. 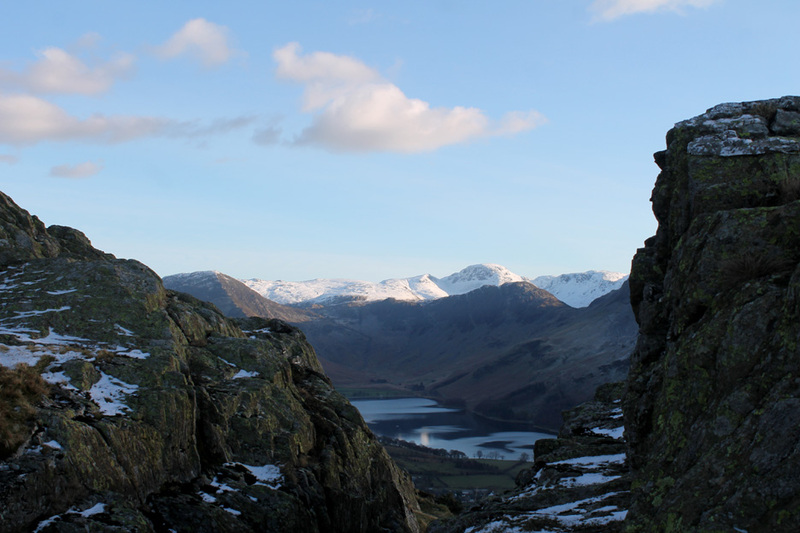 with Fleetwith, Haystacks and High Crag filling in the foreground. So clear you could have seen people on the top . . . if there were any ! It's half term and all of a sudden the car parks are busy . 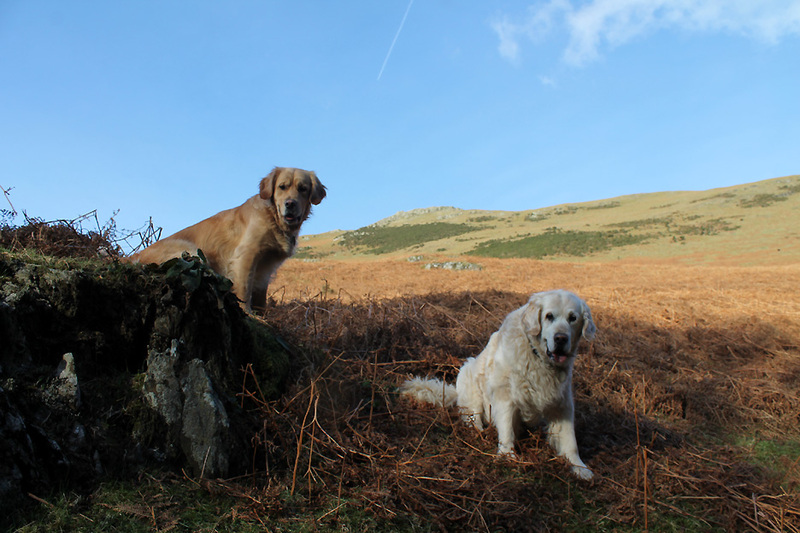 We forgo the main path and strike up through the fallen winter bracken, making a gentle bee-line for the ridge. Dylan . 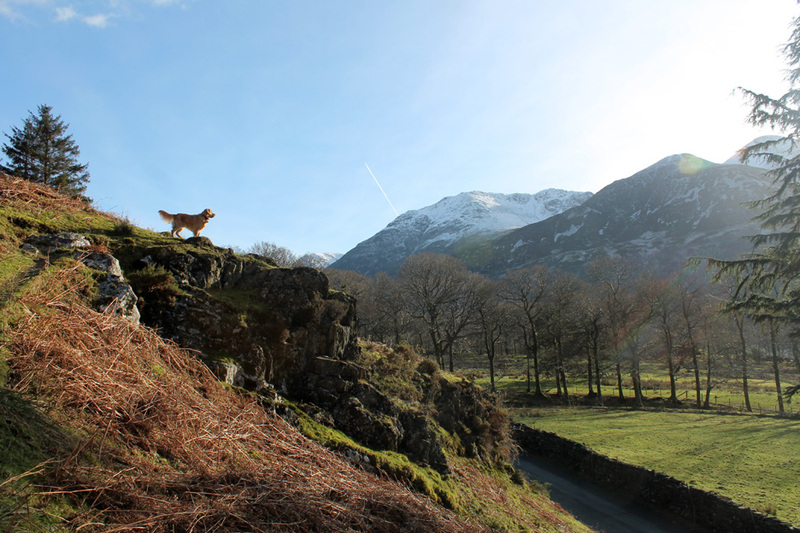 . . revelling in the sunshine and the open spaces. Not far behind, but at a more gentlemanly pace befitting his age, follows Harry. 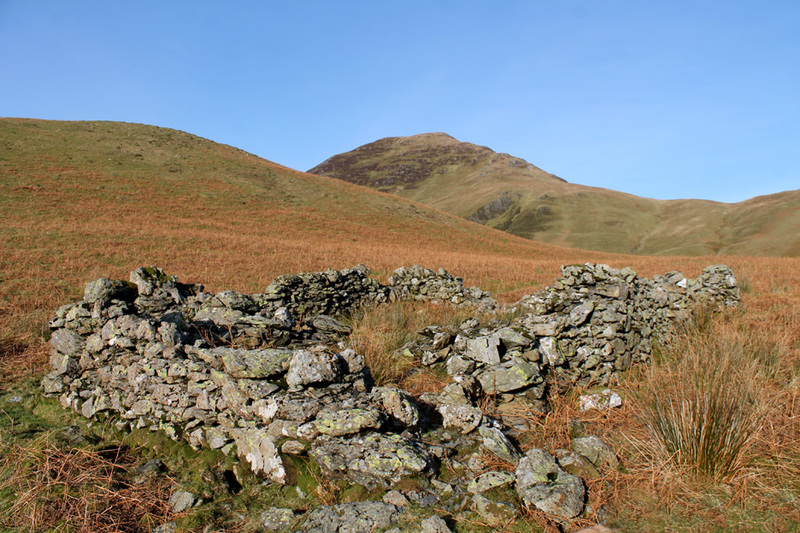 Our arbitrary route brings us up directly alongside an old sheepfold. 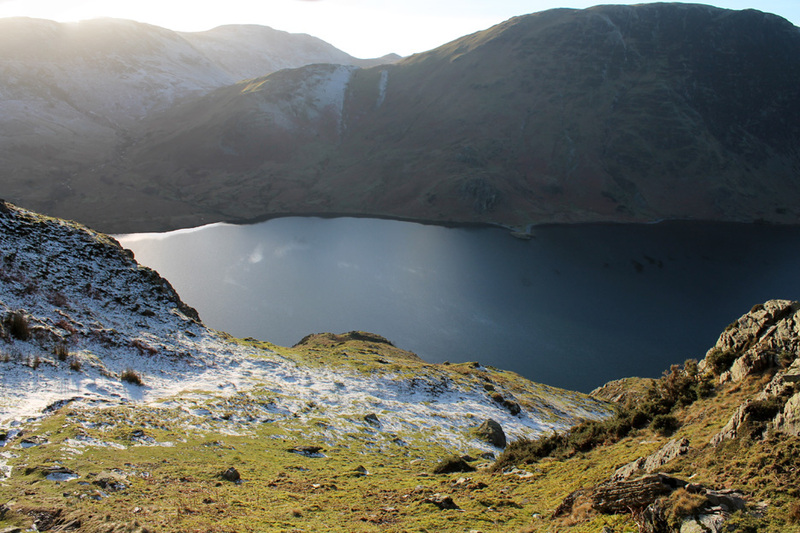 Low Bank (the Rannerdale Ridge) to the left and Whiteless Pike in the distance. 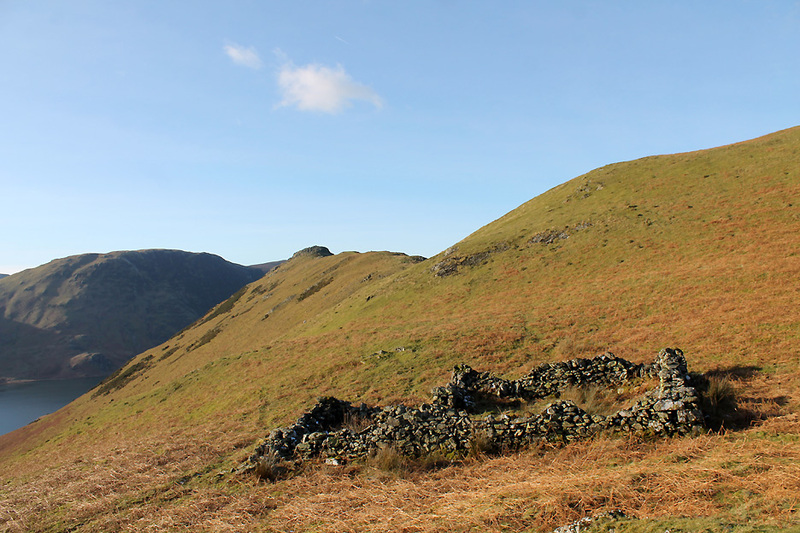 Ann takes a wider loop, missing the sheepfold . . .
. . . but catching this nice panorama including Robinson and High Snockrigg. That looks familiar from last week . 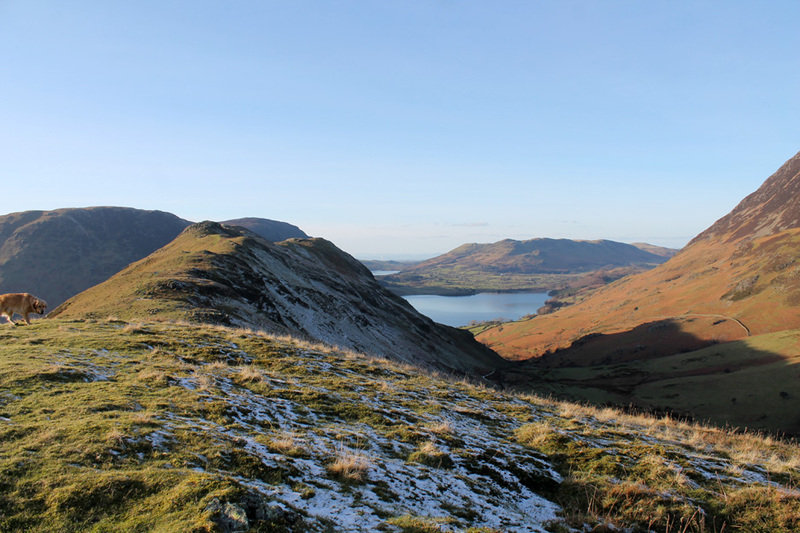 . . Grasmoor. The spur below it is the start of the Lad How climb that I used with Jenna last Saturday . 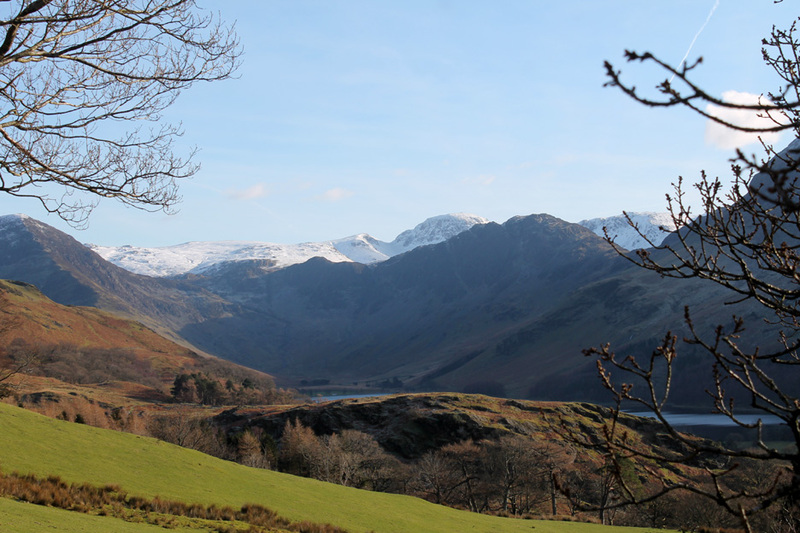 Snow still lies on the northern facing slopes of Rannerdale. 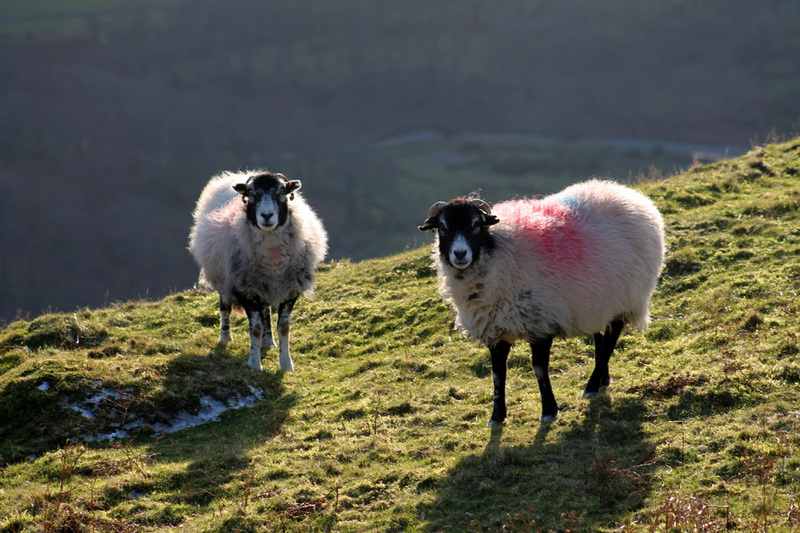 The southern side has warmed and makes better grazing for these Swaledales. Catch a quick picture before they notice me . . .
. . . and another as they look up and smile at the camera (well sort of ). 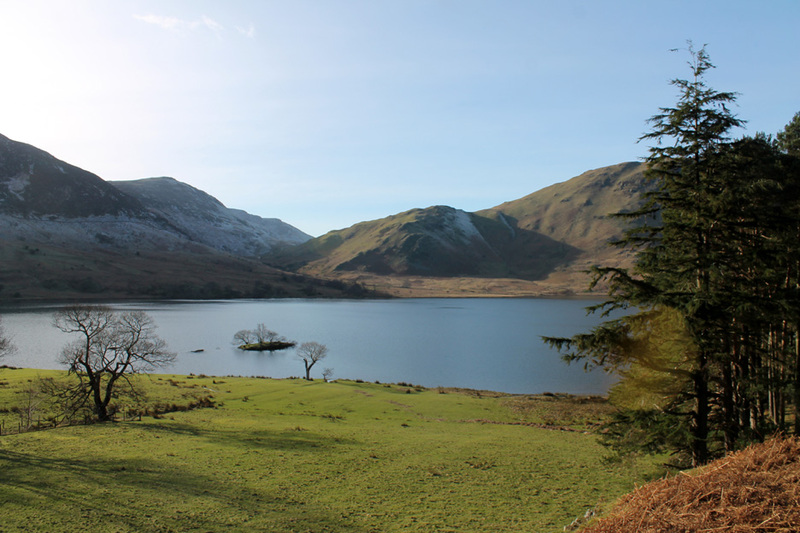 The first Knott of Rannerdale Knotts. 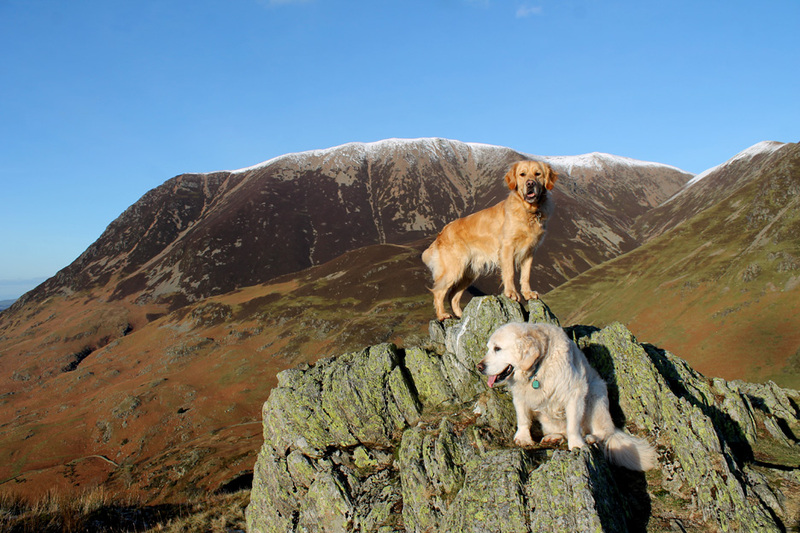 I encouraged the dogs up onto the rock but I couldn't have organised a pose like that if I'd tried ! 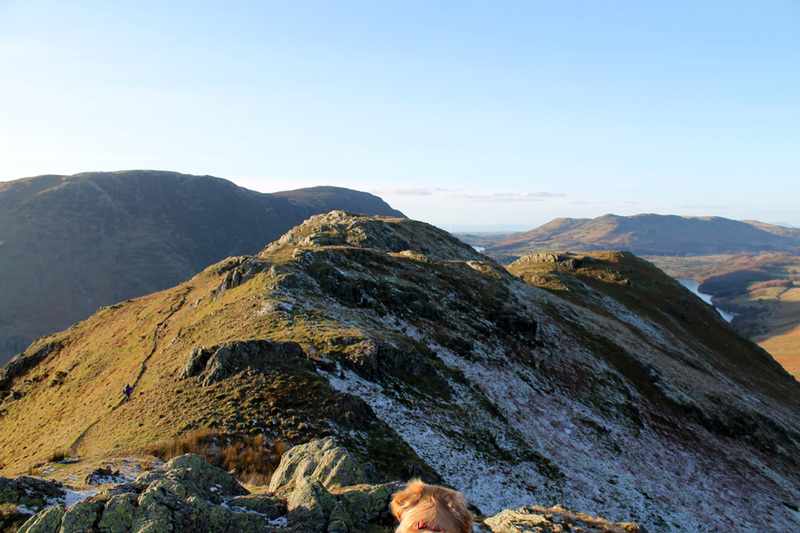 Dylan's view from this second summit. 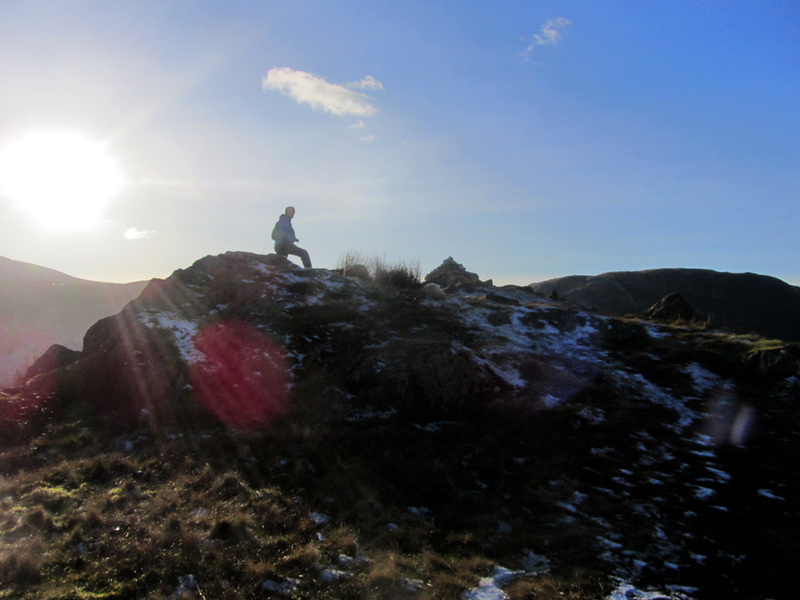 Ann catches me in a summit photo, flare on the lens courtesy of the bright sunshine. Can't complain . 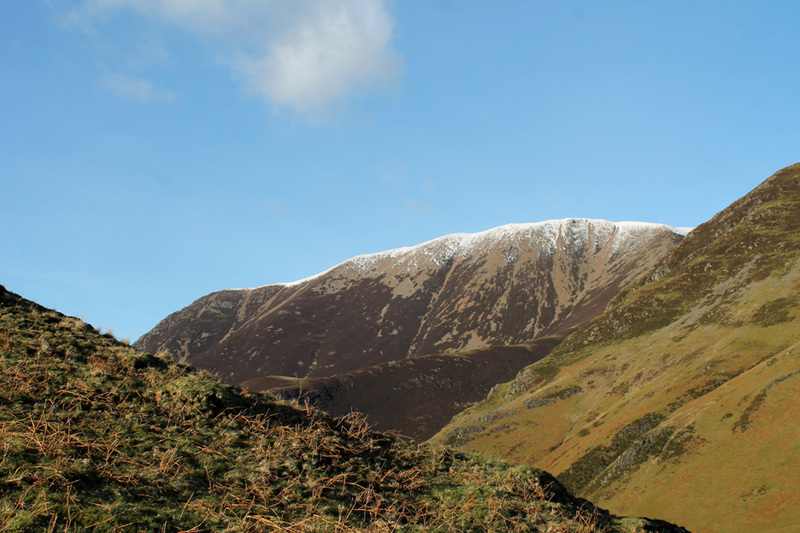 . . it was a lot warmer that Grasmoor. 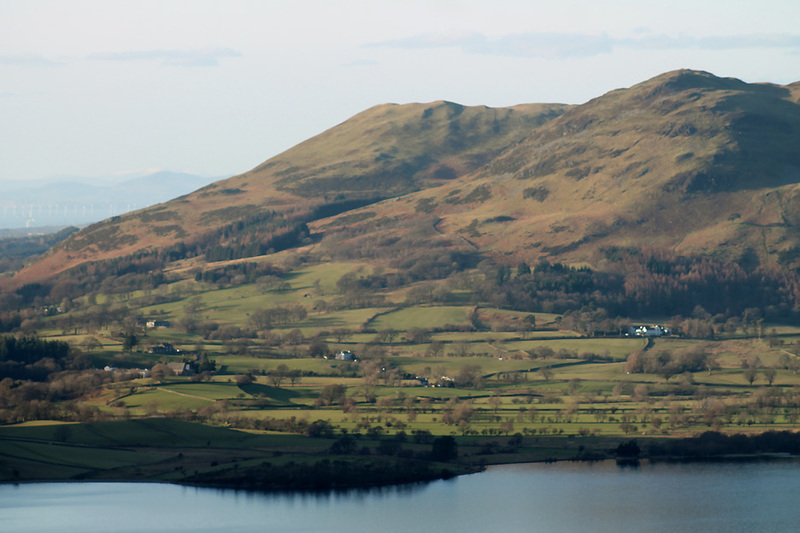 and Loweswater sitting between the slopes of Mellbreak and Darling Fell. 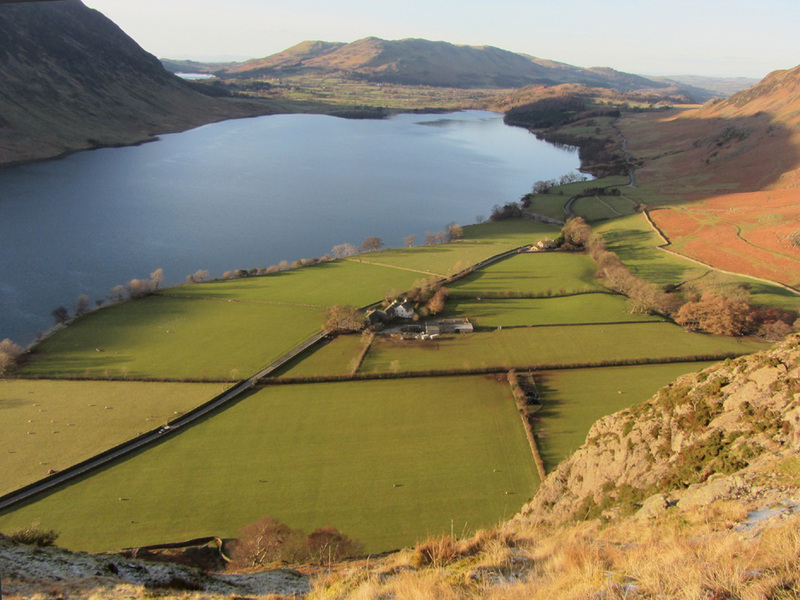 Zooming in on the hamlet of Loweswater . 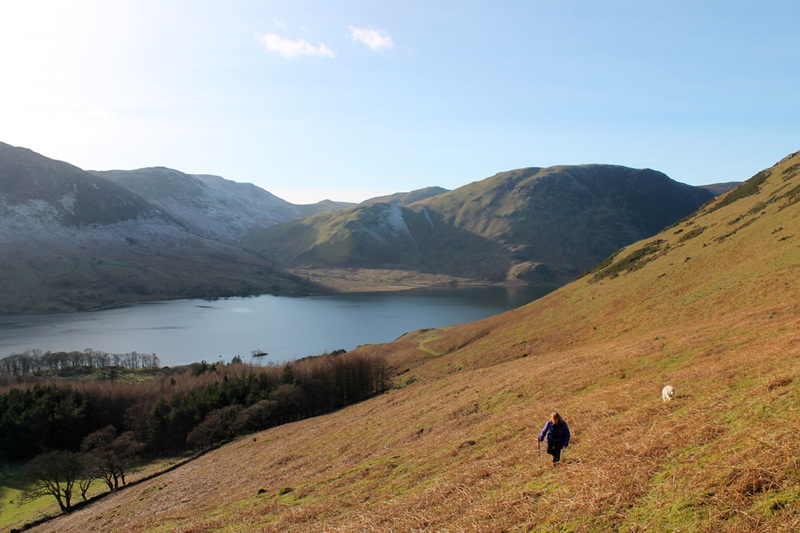 . . Highside, the Kirkstile, the Church, the Vicarage and our house. 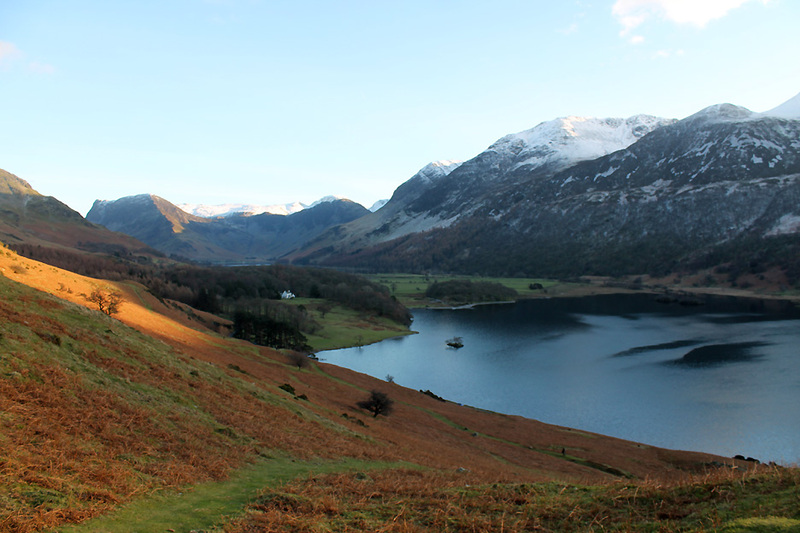 See that big white house tucked in below Low Fell . . . that's not ours ! 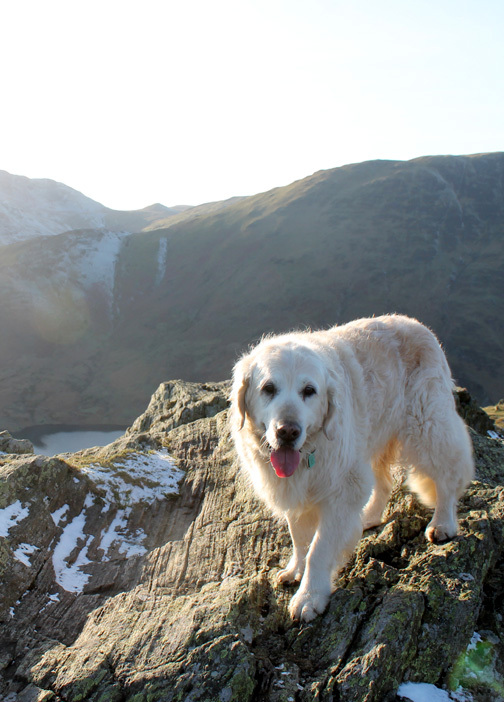 Harry on the summit rocks. 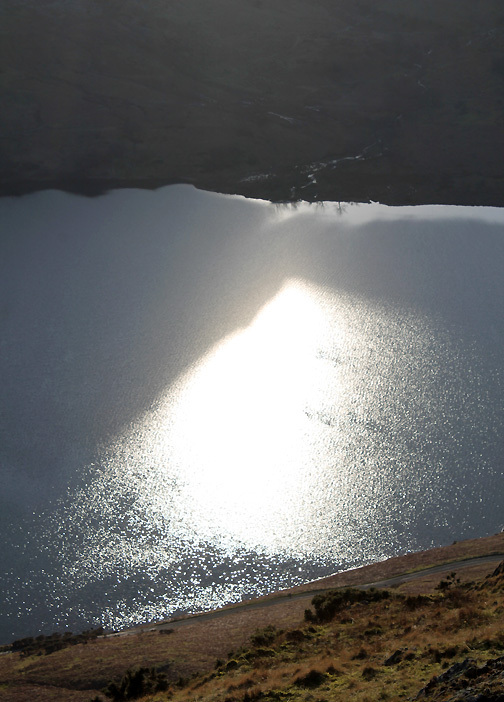 The sun sparkling on the lake far below. 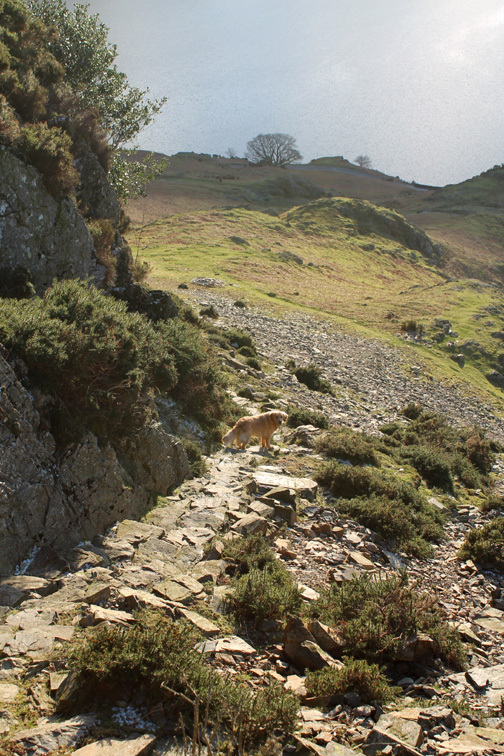 Through the gap that separates the summit from the rocks of the end viewpoint. 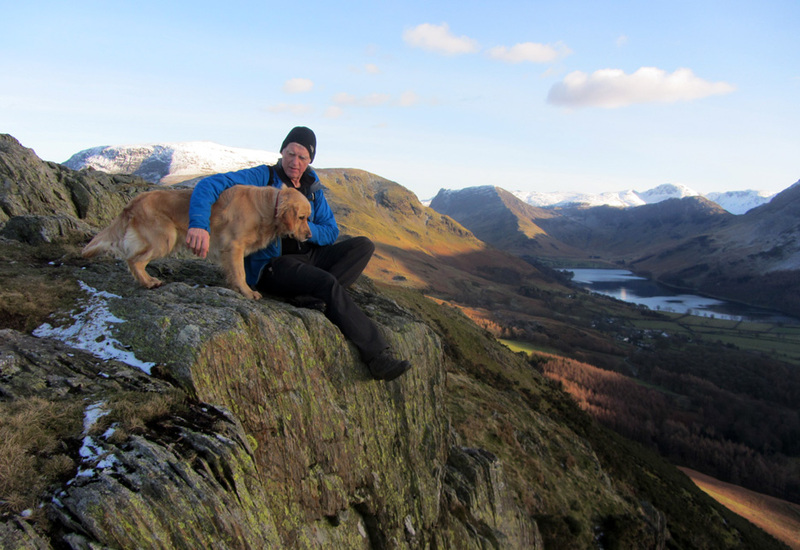 Time for a quick sit and take in the view . . . Dylan is not convinced by the look of it ! 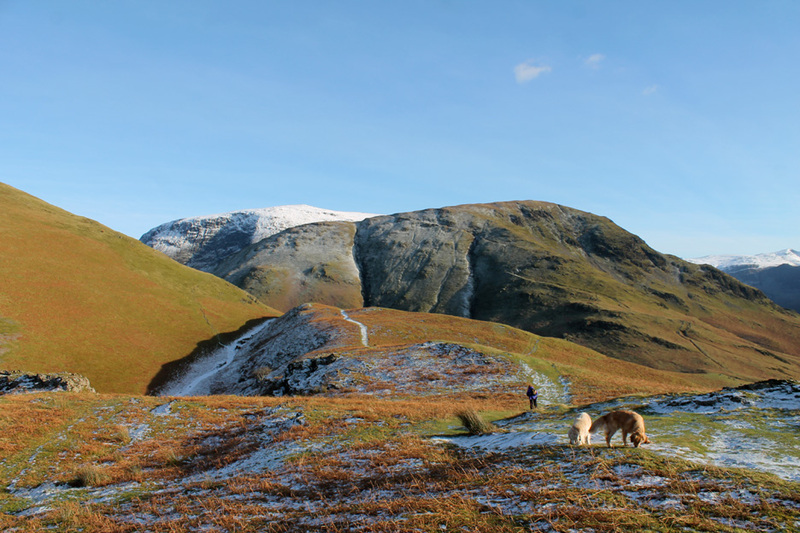 we head down the steep western end of the fell, taking care on the snow covered grass. 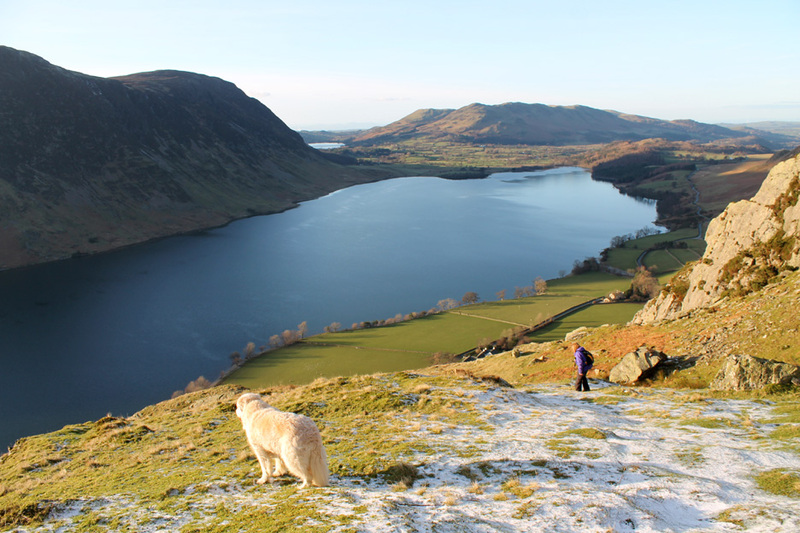 Fine views down onto Crummock Water today. 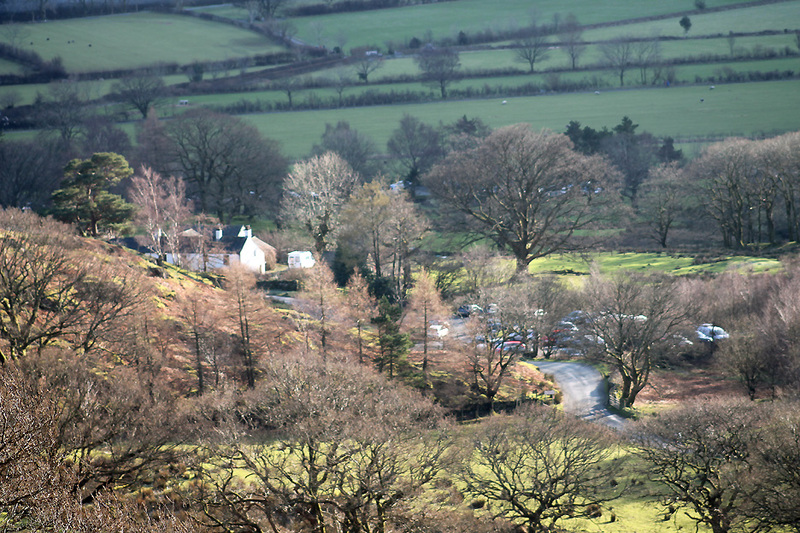 On the flat ground at the foot of the fell is Rannerdale Farm. 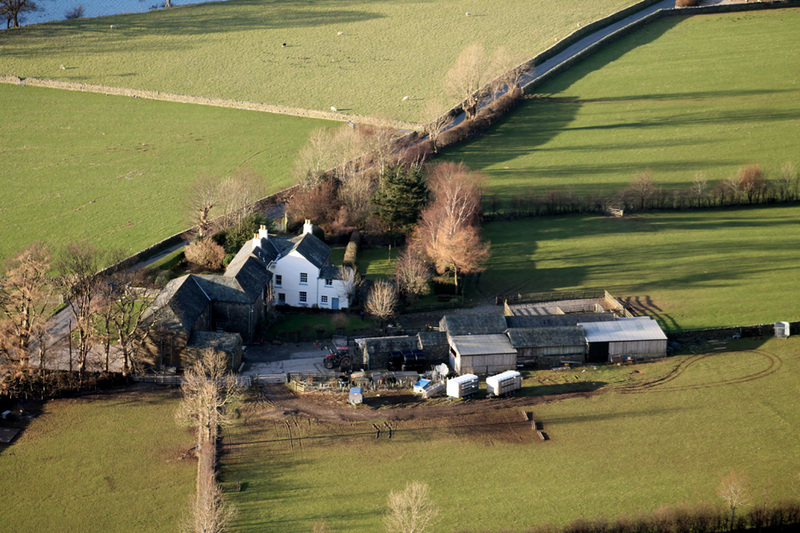 Close up of the working farm from our vantage point high above. 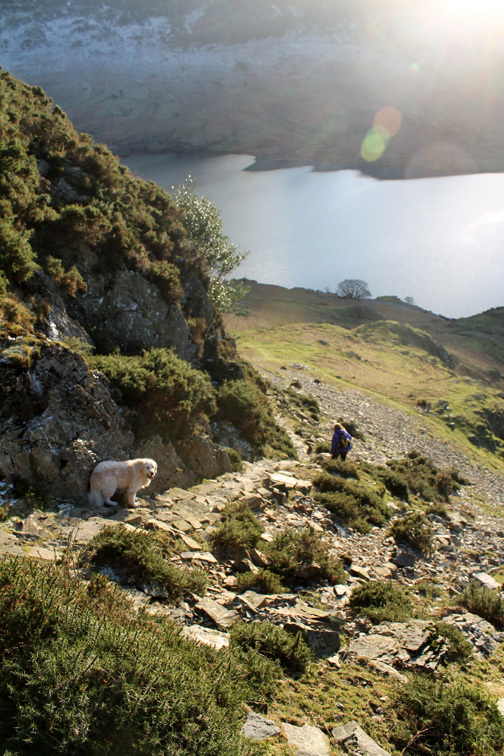 Dylan leads the way down the pitched steps . . .
. . . followed in due course by Ann, Harry and myself. Rather than descend all the way to the road we continued straight on at this point and joined up with the lower track once more. 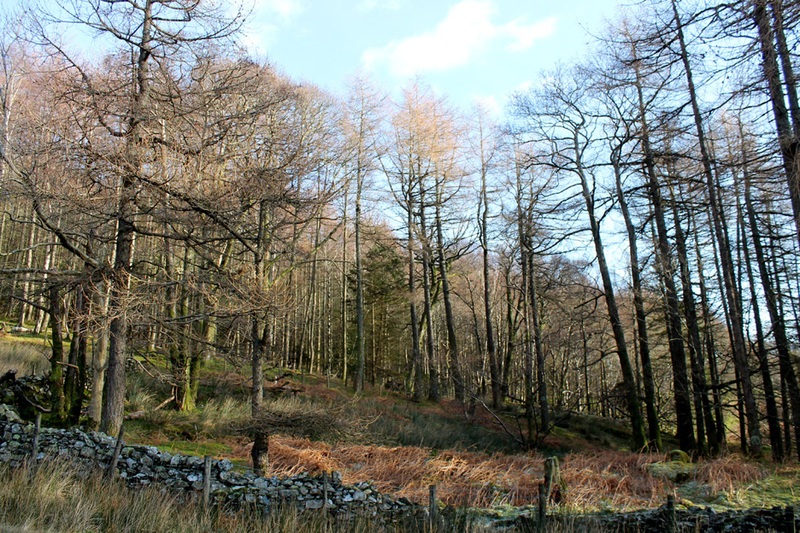 Below is the old bridleway over Hause Point and therefore our route back to the pine trees by the lakeside. One last shot from just below the path. The afternoon is drawing in but by walking this route we've spent most of the afternoon in the glorious sunshine. This site best viewed with . . . sunglasses and sunscreen (only joking).